"It's a real charmer... makes this endearing fairytale all the more timeless even as its underlying politics and the irresistible Šafránková give it a decidedly modern slant." Does Three Wishes for Cinderella suffer from PAL speedup or was it filmed at 25fps? Yes, any PAL DVD edition of THREE WISHES FOR CINDERELLA release running is affected by PAL speedup. The film was originally shot on 35mm, 24fps. 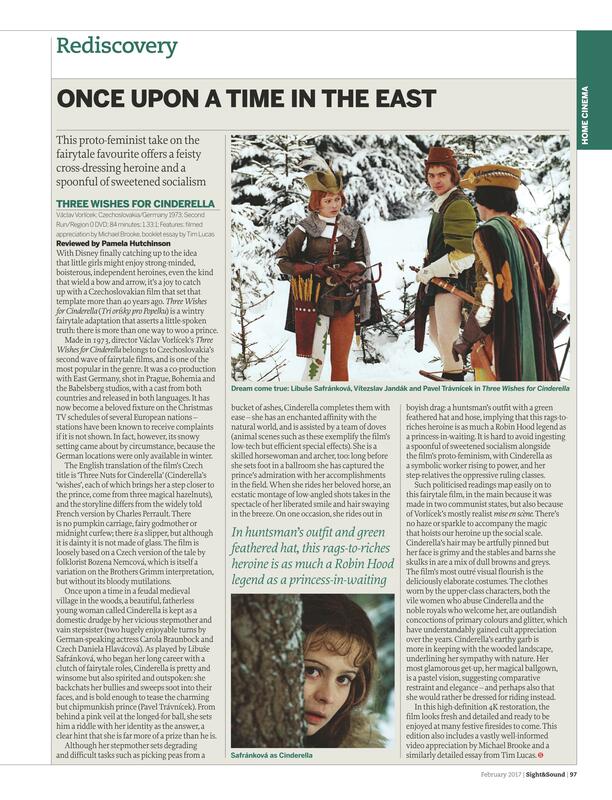 "It's one of the finest and most creative dramatizations of the fairy tale... this is a very clear and sparkling presentation that makes a fine way to make the film's acquaintance." "Second Run have really exceeded expectations on this package; it truly is a beautiful set"
which was still audible in the background. It took me a while to find it on BBC Genome, because the BBC called it Three Gifts for Cinderella. It was indeed Gabriel Woolf narrating. First showing February-March 1975. "In this high-definition 4K restoration, the film looks fresh and detailed and ready to be enjoyed at many festive firesides to come. This edition also includes a vastly well-informed video appreciation by Michael Brooke and a similarly detailed essay by Tim Lucas."